This fall, the Attorney General's Office will be implementing a new enforcement measure for parents who are behind on child support payments: blocking them from renewing their vehicle registration. The Texas Attorney General's Office has found a new way to punish parents who are behind on child support payments: blocking their vehicle registration renewal. The agency plans to employ the new tool beginning this fall against parents who haven't paid child support for at least six months. The attorney general's office is already able to revoke driver's, professional or recreational licenses of evaders, but the agency said adding vehicle registration should shore up compliance. "We're going to use every tool that we can to collect support that is due to children and families, and that's why this initiative is being pursued," said Janece Rolfe, a spokeswoman for the Child Support Division, in an interview last week. But some family law attorneys question whether the policy will actually make it even tougher for some parents to catch up on their payments. Tim Mahoney, an Austin-based attorney who frequently litigates child support cases, said in his experience, most cases of overdue child support arise when a parent can't afford to make the payments they owe, not because they're actively avoiding them. "I think it's really bad in terms of public policy," he said. "Because if you're wanting people to pay child support, it would be really good if you could provide them with the means to earn a living." The new measure will apply to vehicle registrations up for renewal beginning in December, according to Rolfe. Those Texans with at least six months in unpaid child support payments can expect to learn about the potential roadblock in September in their standard three-month renewal notice. Rolfe said parents will also receive a letter from the Child Support Division ahead of their vehicle registration's expiration date with information about steps they can take to remove the hold on their renewal. "The goal, obviously, is not to keep people from working or getting to work, but it is to gain compliance with court orders and to get support and money to children," Rolfe said. Parents will not be required to pay the total amount they owe in order to have the hold released. "However, a payment arrangement must be made and fulfilled," she added in an email. "There is a dedicated phone line parents can call to make payment arrangements." The agency's new enforcement tool is not the result of a recent bill passed by state lawmakers. Rather, Rolfe said the Attorney General's Office is "required by law to establish, enforce and modify child support orders" and opted to expand the ways it can pressure child support scofflaws to pay off what they owe. She said the office was within its rights under the Texas Family Code to institute such a policy without seeking new legislative approval. The Texas Attorney General's Office has long led the nation in collecting child support payments. On Monday, the office issued a press release boasting that Texas had collected "more than $3.869 billion" in the past fiscal year and collected more money in child support than any state in the past nine years. Cheryl Alsandor, a Houston-based attorney, said she was concerned with the reach of the policy because, unlike revoking certain licenses, there is no state requirement for an administrative or judicial hearing to determine whether the renewal should be denied. "I think it's a great way to get someone's attention to pay their child support because they're going to lose the right to drive their vehicle," she said. "But on the other hand, my concern would be that the state would have authority to deny their registration without due process, without a judge having considered both sides or both opinions of the state and the obligor who has to pay." “If you're wanting people to pay child support, it would be really good if you could provide them with the means to earn a living.” — Tim Mahoney, an Austin-based attorney. 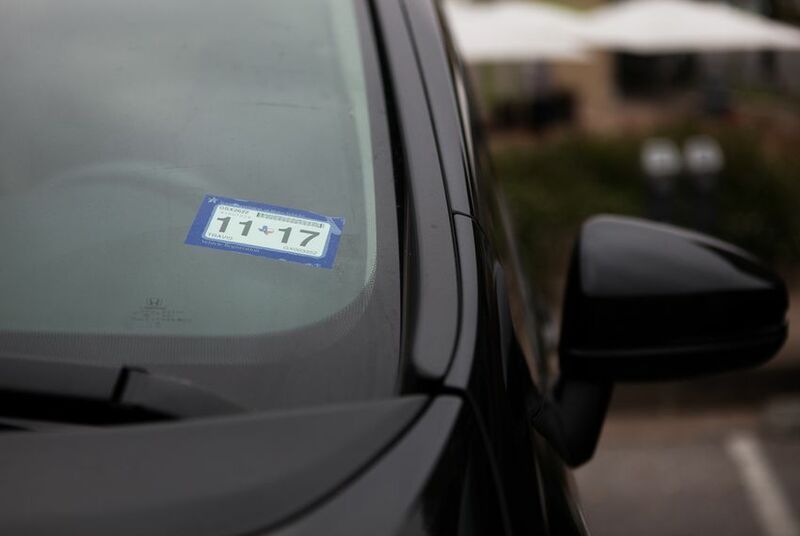 Texas drivers are required to renew their vehicle registration once a year. Last year, the state launched its "Two Steps, One Sticker" program allowing vehicle registration stickers to also serve as proof of vehicle inspection. The state charges a base registration fee of $50.75, and local counties often include an additional fee. Rolfe said the initiative only applies to vehicle registration renewals. Individuals who would be denied renewal under the measure would still be able to register a new vehicle, a caveat Mahoney said could adversely affect certain populations. "This kind of policy attacks people with less resources than rich people," he said. "If you've got enough money to go out and buy a new car, it doesn't influence your ability to get a new registration." In addition to financial concerns, Mahoney said when the state resorts to revoking licenses, it can have drastic consequences. "I've just seen way too many instances of where people cannot overcome the hurdle of having your driver's license revoked [or] professional licenses revoked, and they don't always have the wherewithal to go back and get them reinstated, so it ends up being kind of a permanent disability," Mahoney said. But Leslie Hope, a Dallas-based attorney who handles family law cases, said she has never seen a child support case where the Attorney General's Office tried to revoke a parent's driver's or professional license and wondered why the state doesn't make more use of that enforcement mechanism. "I think revoking a driver's license would be a much more effective tool than the vehicle registration," she said. "But I guess it can't really hurt. It's just one more avenue. I think what people will start doing is putting vehicles in other people's names to avoid having that problem." Clarification: This story has been updated to clarify that an Attorney General's Office spokeswoman said the agency did not need to seek new legislative approval to begin blocking vehicle registration renewal of some child support evaders as the agency already had the authority under the Texas Family Code.